In 1953 Wes Nothstein and Harvey Hart put their heads and names together to establish Nothart Engineering Sales Ltd. They were both excellent process Engineers. 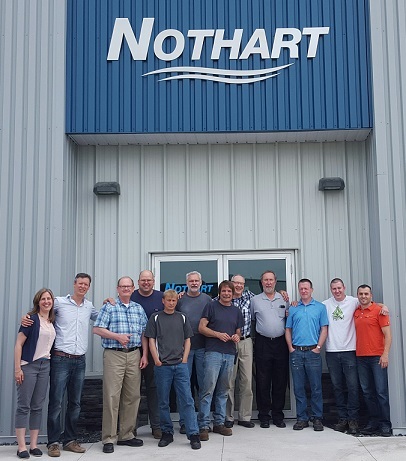 Nothart flourished as a Sales Agency representing premier product lines such as Canada Pumps, Buffalo Howden fans, Lightnin mixers, and Smith & Loveless Systems. John Hawryluk joined the firm in 1972, working with Wes Nothstein until 1991, when he purchased the shares of Nothart. John continued the tradition of Nothart until 2003, when he retired and sold Nothart to partners Gord Day, and Scott Struthers. In the ensuing years Nothart has seen dramatic staff growth. Nothart has continued the traditions established in 1953, and grown by adding many quality-driven product lines. This has brought the company to the present, and prepared it for the future.The future looks bright for Nothart with our 20,000 sq. ft. building in the Fort Garry industrial park. This has provided the necessary space for our full service shop and warehouse facility. We have continued, and will continue to add to our product lines and service offerings as opportunities become available. While this brick, mortar and mechanical equipment will provide a valuable tool, the real engine for continued growth and success remains our core of dedicated, talented and, I must add, fun loving customers, who appreciate our ability to help them.